I hear from a lot of people that would like to travel by bike but are unable to do so for a number of reasons. Carrying clothing, tools, and perhaps camping gear seems overwhelming. Combine that with fitness and most people look at bike touring as too difficult. Another factor for not touring is disparate fitness levels of family members that is exacerbated by carrying equipment for touring. There are issues during a tour that may also cause people to not travel by bike such as mountainous terrain. Distances between lodging and food services may also be prohibitive to the potential bike traveler on a conventional bike. In my opinion, an electric bike could very well be the answer to the concerns that I hear. Want to travel with a spouse that due to fitness or a disability is not possible on a conventional bike then get out on an electric bike. A trip to bond with mom or dad-electric bikes would be the answer. If twenty miles is the most you could imagine riding with gear you could more than double that with an electric bike. An electric bike could also be a good choice for a group tour, commercial or otherwise, including trips in which your gear is carried for you. After attending a talk on electric bikes at the Utah Bike Summit, I spoke with Duane Schaffer of Blue Monkey Bicycles, a shop in Murray Utah that is an electric bike dealer with extensive experience. Cycling Utah: I really think electric bikes could carry someone across the U.S. on a bike tour. Are you familiar with anyone doing that? 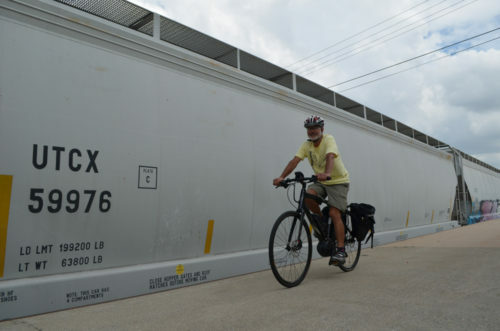 Duane Schaffer: There have been a few known journeys across the US on an eBike. Cathy Rogers rode 3300 miles in 48 days on a Pedego. She was with a group of regular cyclists. She carried multiple batteries. A Pedego would not be my first choice for eBike touring but this shows that it can be done. I think we haven’t heard of touring on an eBike because up until now, they haven’t been practical enough to do so. Until about 2008-2009, electric bikes were what I called “neighborhood toys”. The early bikes had sealed lead acid batteries and barely enough power to offset the weight of the electric system. They were slow at about 15mph. When lithium batteries came into the picture, the power to weight ratio greatly improved. Also, lithium batteries have no memory and no maintenance so bicycle manufactures can focus on the making the bicycle and components better and lighter. Most eBikes weigh around 40-60 lbs now which may seem heavy but 80-90 lb electric bikes were common less than 10 years ago. At the lighter end of the spectrum are the mid-drive bikes; particularly the Bosch equipped models. Bosch created the system and various manufacturers build their frame around the system. The mid drive is the key to long distance touring. I believe eBike touring will take off now that these bikes are available. C.U. : There are some advantages to having an eBike for commuting. Can you discuss some of the advantages that an electric bike would have for someone traveling by bike say to Yellowstone National Park and back to Salt Lake City? D.S. : Bosch created their mid-drive system around 2010 and there are at least 80,000 of these bikes riding around Europe with many thousand trouble free miles on them. The mid-drive system just barely hit the US late last summer and so far they have been enthusiastically accepted. I think the mid-drive is the key to eBike touring. It’s a lighter motor and it helps the rider pedal vs. the hub motor, which just augments the pedaling. The mid-drive is very efficient and can go 2-3 times the distance of a hub motor bike with the same battery capacity. This is mainly because the mid motor helps the force of the pedaling whereas the hub motor has to get the wheel turning to propel the bike. General lithium battery hub motorbikes will travel 20-30 miles on a charge. A mid-drive motor equipped bike with the same battery specs will travel 50-100 miles. . I would think a loaded SportE at a conservative, comfortable pace over rolling hills (moderate climbs) could get you 60 miles easily. There are usually different levels of “pedal assist” which means there are different percentages in which the battery can help you. The lowest setting just barely helps you and you get a good work out from that. This level is good to offset the weight of the system and uses the least amount of battery. (You can shut the system off at any time and ride it solely as a bike and use no battery power.) The highest level of pedal translates to about 250-300% of your pedaling and helps for climbing immense hills but also uses up the battery quicker. If you do need to pack an extra battery, the Bosch batteries are some of the lightest at about 6-7lbs apiece. Lou Melini with the Felt Sport E electric bike. E-bikes make a great option for bicycle touring for some riders. The bike retails for $4999 and features a Bosch mid-bike motor with lithium-ion battery. C.U. : From what you just said I may or may not need a back up battery to do a tour on an electric bike if I arrive at a motel or campground every night to recharge the battery. How long does it take to recharge a battery? D.S. : Batteries usually take about 4 hours to fully charge. 80% charge comes in an hour and a half and then the rest is trickle charge. You can charge them at any time, you don’t need to wait for full discharge or need to fully charge them. The batteries will hold a charge for at least 2 months in storage. They have a management system that shuts off the charger when the battery is done so you don’t need to babysit the charge function. We do recommend not leaving them plugged in for months on end because it’s not good for the charger itself. The batteries are specific to the brand and style of bike. There are no universal Ebike batteries. The best brands use Samsung cells in their cases. All the brands we carry in the store use Samsung, the same cells used by Tesla and Nissan for their cars. Extra, specific fit, proprietary batteries run about $600-$1000 depending on the brand. The good news is that the current lithium batteries should last around 5 years, at least 2000 full cycles. We’re hoping that things will be more competitive and prices will come down by the time replacement is needed. C.U. : You seem to favor mid-shaft (bottom bracket) drive electric bikes over hub drive. I assume fixing a flat tire is another reason for the mid-shaft drive bike? D.S. : Yes, A hub motor is more difficult to remove in the event of a flat. There is a power cable to unhook and usually a stout bolt (19mm usually) and sometimes a torque arm to remove before pulling off the wheel. With practice, it’s not too bad of a procedure but not one you’d like to accomplish on the side of the road. The mid-drive bikes have regular wheel sets and remove and replace just like a regular bike. C.U. : Many cyclists, myself included, would wonder about fit of a bike. Do the electric bikes come in a variety of sizes for the discriminating cyclist? D.S. : The Felt Electric bikes have the same care taken with them as the rest of the non- electric Felt line. We like this because Felt electric bikes are bicycles first, they just happen to be electrically assisted. The SportE for instance is available in 5 sizes and 2 step-thru sizes. The frames are sized accordingly but the stems also vary in size so the whole bike is scaled up/down. This makes it a lot easier to properly size the bike for a long journey. Other hub motor brands typically have 1 or 2 sizes in each model. C.U. : I was very impressed with the Felt bike that you showed me. What is the range of weights for an electric bike? D.U. : Felt’s lightest Bosch bike is about 39 lbs. Most other eBikes, mainly hub motor bikes are between 45-65lbs. I hear that you travel a bit heavy so if someone is “credit card” touring (not camping), a Felt electric bike with rear panniers for clothing and other travel items will weigh less than what you travel with when you include your camping gear! C.U. : What would someone expect to pay for an eBike and how long is the warranty on the “electric” parts? D.S. : We have a hard time finding good electric bikes under $2k. By the time you add the expense of the system, the bike quality begins to suffer under $2K. The bikes we sell in the store range from $2300- $5800 at the moment. $3K will get you a nice hub motor bike. The Felt SportE is $4K with better components and the Bosch system. The warranty will be at least 2 years with great support. C.U. : What are some of the routine maintenance steps (if any) needed for the battery; for the rest of the bike? D.S: Typical normal bike maintenance, chain, brakes, derailleurs, etc. The electrical system consists of battery, motor, controller and display. We try to deal with well-supported, reputable companies that we know will back us up so we can keep our customers on the road. When problems do arise, they’re pretty easy to diagnose and every component is plug and play. A new part can be fitted without tearing the bike apart or rewiring everything. Many times a regular shop can handle the repair if the bike is away from home on a tour. The Bosch system is quite robust and Felt has not heard of any problems related to it yet in the 10 months that they’ve been available in the states. C.U. : Are there weather concerns with the electronics/battery such as heat, cold or rain? C.U. : If riding through various states, are there any special regulations that a bike traveler would need to know about? How about bike trail riding? D.S. : The federal government has stated that an eBike is considered a bicycle if it can’t go faster than 20mph under its own power with a 175lb rider (the weight of the rider seems to change). There are plenty of “grey area” bikes out there that will go faster than this. I personally like to commute about 24mph. Lou, I’m glad you agree that going faster than 30mph is unlikely and probably not practical on a touring bicycle, so there should not be a problem touring on an eBike within the current regulatory statutes. There is lots of legislation happening now with state and local officials across the country trying to figure out what to classify eBikes as. The biggest concern is off road single track. EBikes are still questionable on those. I regularly ride an eBike on the Jordan River Trail and have no issues. I think someone planning a trip needs to be aware of the issues but it shouldn’t stop them. Worse case scenario, you ride it like a regular bike. I think if eBike owners are courteous, there won’t be any issues in the future but it just needs to become a little more common place first. C.U. : So after all of this, what would you currently recommend for the person looking to travel on an electric bike? C.U. : The market for touring bicycles is small. If marketed and promoted well, could you envision a small boom in electric bikes for bike travel? D.S. : I think once the lightweight mid drive bikes catch on, you’ll see a trend in eBike touring. Whether its for a spouse or friend whose not quite up for the journey or more people joining in because its now accessible. I think the revolution is around the corner actually. You will be the one to start it Lou, and we will help. C.U. : Duane, thank you very much for your time and say thanks to Mikey for doing the pictures. This talk has been very interesting and educational. I’m not quite ready for an eBike as I can still travel 75 miles/day with a 75-pound bike with camping gear. Some day I envision using an eBike in lieu of paying a company to carry my gear. I am sure that there are a lot of potential users of electric bikes for touring at this time. If you think an electric bicycle is right for you go see Duane Schaffer or Mikey Geurts at Blue Monkey Bicycles. I have had several people tell me that the service is superb. 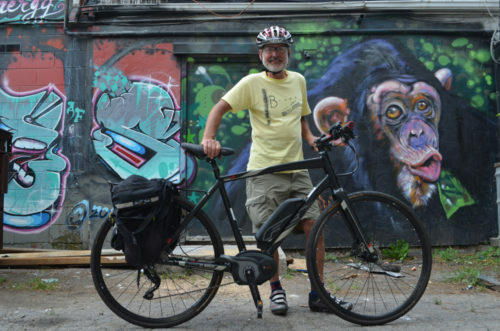 One Response to "Electric Bikes for Touring: An Interview with Blue Monkey Electric Bicycles"
After this guy claimed that a mid drive will go two to three times further on similar batteries it’s hard to take anything he says seriously.